New: Assetto Corsa Export plugin added. Geometry, materials and shaders are all exported allowing tracks to be edited and created. Please note that at present car models do not work. New: Assetto Corsa import supports shaders and their associated variables. The Assetto Corsa plugins also ensure that the Ks Shaders are available in the Edit Material Pane. Note that 3DSimED does not have the vertex and pixel shaders to render these shaders correctly. New: The Collada Import Plugin can now read skeletal character animation. At present the transforms must be defined by matrixes and not axis angle, and there is a limit of 40 bones. New: Collada Export gives the options of exporting multiple texture channels. Nodes are now named according to the object associated. New: A function Export->Export RF2 Anm allows a character animation to be saved to rF2 format. This is intended to be used with the Collada Import of animations. New: Material Edit Pane allows user variables associated with imported shader data to be modified. At present Assetto Corsa is the only sim with this support. Enhanced: Memory handling has been improved it is easier to edit large models than before. Enhanced. Collada Import no longer allows materials to share vertices, this helps with the editing of multi-channel texture coordinates. Enhanced. A much large range of replacement tokens is allowed when importing ISI car models. There was a bug with the group edit of objects with Set Tag which caused all modified objects to be assigned the same instance name. Edit Paste Vertices could cause an exception error. Very small triangles could not be selected. Go to the 3DSimED3 Download page. A new version of the Collada Import Plugin, for 3DSimED 3.0s, supports multiple texture channels. The updated Import plugin for Collada .DAE files can be found at the downloads page. New: Plugin to import car models from Test Drive Unlimited 1 & 2 from the 3DG geometry or BNK archive. New: The Primitive Box function has the option to generate a bounding box surrounding the Editable Face Data. Enhanced. The pivot point is always saved to a .GMT when exporting a single model for rFactor, rF2, and the other ISI formats. When saving a scene the pivot point will only be saved if the Moveable attribute is set for the object. Enhanced. The Collada Import Plugin new reads fixed skin meshes. Enhanced. Paste Material on the Material Edit pane now gives the option to overwrite texture maps. Enhanced. Dirt ShowDown Import Plugin attempts to correctly set the transparency of materials, previously all were set to alpha blended transparency. Enhanced. The Group Instance Edit pane has a copy function to place the group on the clipboard as an object. Enhanced. Export DXF is improved. Undo could take too many steps back when used from any of the edit panes. On the Object Instance Edit pane the shadow options presented did not update when the Object Shadow option was changed. An object with scaling not set to 1.0 would be incorrectly positioned if it had a non-zero pivot point. The magenta colour of the ‘missing texture map’ rendering has been altered to prevent the Fresnel shaders rendering bright white if the fresnel texture is missing. New. The view roll angle can now be set, the tilt of a mouse wheel can be used to change the angle. New. For Objects with multiple animations the rendered animation can now be selected, this is particularly useful with objects such as corner workers. New. Objects now have an Instance Name, this is useful when editing .scn files for rFactor and rF2. New. The Import file dialog and many other file open dialogs now have a recent folders button. New. Edit->Object By Name now shows the Object tree and allows selection of an Object at any branch of that tree. New. Object rotations are now always about the pivot center. The Edit Object Pane has a new function to calculate and set the pivot point. The Edit->Center Objects Pivots and Edit->Bottom Center Objects Pivots allow the pivot point to be set for all objects. New. On the Object Instance Edit pane the memory recall (MR) XYZ will update the Pivot Point if the X,Y, or Z Pivot edit box is selected. New. Dirt ShowDown tracks and cars can now be imported. New. Assetto Corsa tracks and cars can be imported with a new plugin. New. Ferrari Virtual Academy 2010 tracks cars can be imported with a new plugin. New. Nascar 2003 environment maps are now supported. The material shader for these environment maps is ‘sphere map masked by t1’. Exporting as well as importing is supported. Enhanced. Selection of geometry is quicker, please note this is at the expense of frame-rate but in everyday use very quick geometry selection is probably more important than high frame-rates. The view could disappear when looking directly down or up. The view was not correctly panned by the keyboard arrow keys. When using Primitives->Add Object new textures were not rendered. Edit->Paste Materials sometimes did not render new textures. A mistake in the tire vertex shader could cause tires to be animated. The Collada Export Plugin now creates .DAE files which can be imported by Bob The Track Builder XPacker. 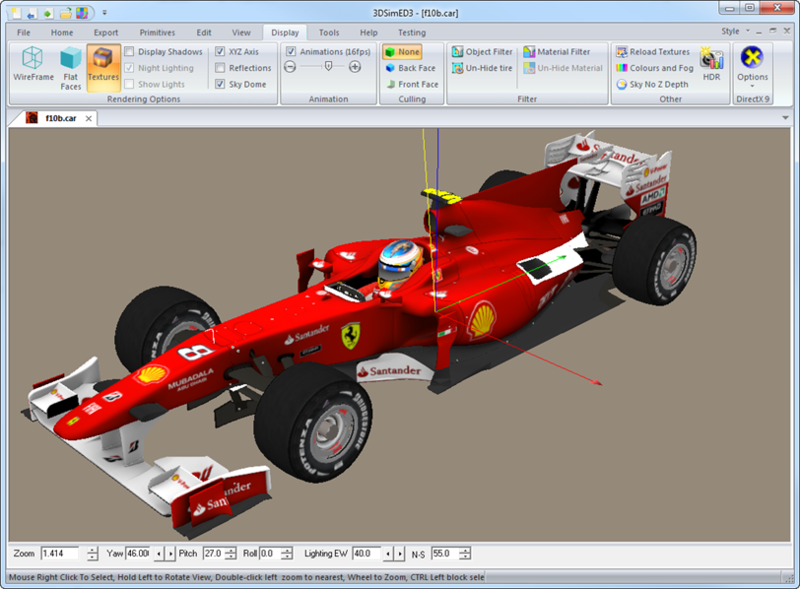 An Import plugin for Ferrari Virtual Academy 2010 is now available for 3DSimED3. It is part of the release package which can be found at the downloads page. A Plugin is available to allow 3DSimED to import Assetto Corsa .KN5 models. The plugin is part of the 3DSimED release package. Download here. Animated objects can be imported from rF2 and rendered. Animated Objects can be moved, rotated and exported back to rF2 format without losing animation. Animated objects can be copied and pasted between models. Enhanced: PSSG Import from F1-2013 is greatly enhanced. Low level of detail within objects is now discarded by default (to include all LOD within objects use Import Options). A database of known transparent materials is used to set material transparencies for tracks. Characters such as drivers, photographers and helmet objects can now be imported. The Y & Z axes can be swapped – see the Import Options dialog. Eye and Walk viewing are fixed. An animated model with low frame-rates will no longer cause delays to menu functions. New: Live reflection map of reflected environment (REFLECTEDENV) rF2 track objects. Road and water shaders will use this reflection texture map.New: Material Animation is no longer restricted to animation of texture stage 0. This allows effects such as water ripple to be modelled. New: The background is now rendered with a sky dome. New: The rendering frequency of Material Animation can now be set. New: NetKar .NKO car models can now be imported. 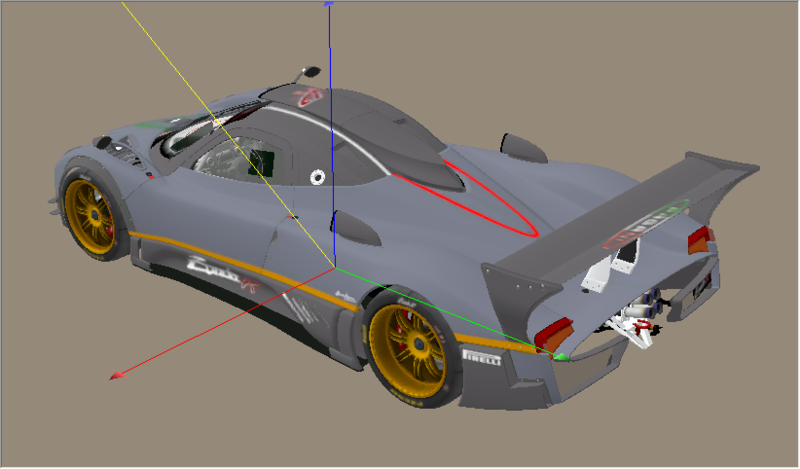 Texture coordinates corrected for F1-2013 import of cars. Improvements to binormals and tangents used for bump mapping shaders. Improvements to rendering with environment cube maps. Fixed problems with XP compatibility.Exported rF1 and rF2 .gmt could become invisible in game.Materials using some of the SRPL Shader Pack were not exported correctly. Cube mapping rendering has been improved. The spinners of the Object and Point Panes could cause small inaccuracies in the edit boxes. View Object was not correctly updating the centre of the drawing. There were problems using arrow keys in the drop-down material list of the Material Pane. The vertex colours and alpha of NFS objects are now used. Import of multi-texture materials in NFS is improved. New: HDR Pane with rendering preview.New: Improved shader handling for 3rd party shaders (such as the SRPL package). New: Import of GRID 2 cars and tracks. New: Import of NetKar Pro .NKO binary files via plugin. Updated Pixel and Vertex Shaders now includes Real Road shader. Export of rF2 objects could fail after erasing Material geometry. Tooltip on Select Shader dialog includes shader title. Attempted fix for some users reporting having to use Reload Textures after Importing. The Display Sky No Z Depth function was broken.